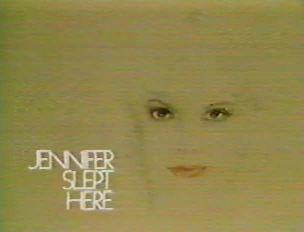 Welcome to my pages dedicated to the short-lived 1983-4 NBC sitcom "Jennifer Slept Here". This series consisted of only 13 total episodes, but was a great show for the short time it was on. Series Synapsis: The Elliot family moves from NYC into the Hollywood home of the late film legend Jennifer Farrell only to find that she's still around, as a ghost that only their son Joey can see. EPISODE LIST Hopefully descriptions at a later time! More Pictures, More Info. Coming Soon!